Connecting to my previous post about an ‘Northern Identity’ which we have here in Shetland, I seem to have started an obsession in my head. Having a few days to think since I’ve finished my placement, I am trying to get my idea’s together for going back to Uni and I thought back to August, when I attended the ‘In the Loop 3.5’ conference. This time the conference had the theme of ‘Making Connections’ but also had a Nordic element focusing on the way that textile cultures may develop in the 21st century. The conference was held as part of an International textile festival by Shetland Arts. 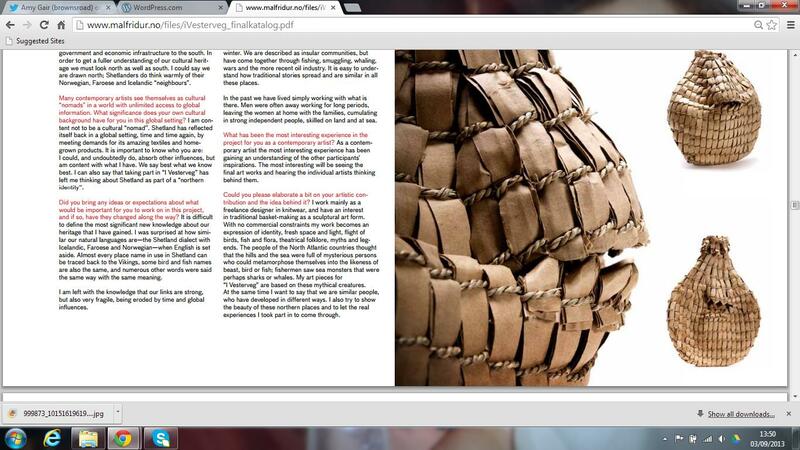 I attended the ‘In the Loop 2’ back in 2010 and I was in the early years of the BA Contemporary Textiles course at the Shetland College – time flies! – So I knew that I was going to be inspired by the key note speakers, designers, students and textile people who would be there, like the last time. There was also a ‘Fair Isle Festival’ which was part of the Textile festival. 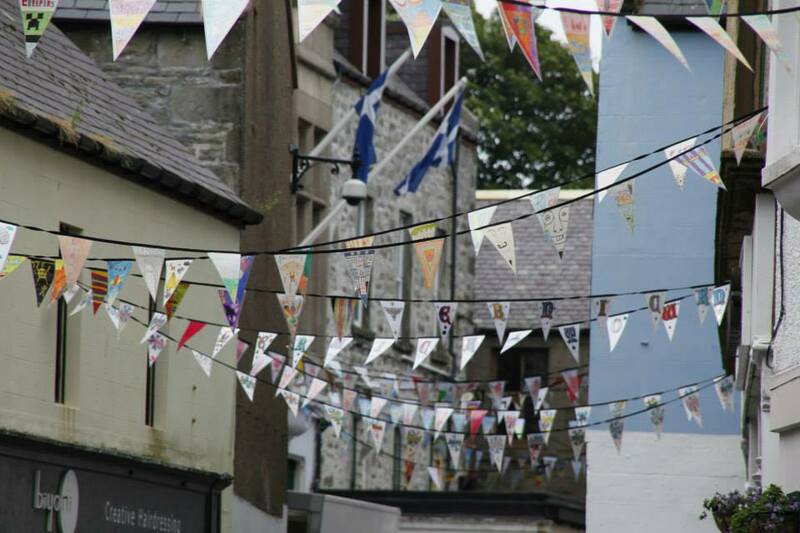 Living Lerwick ltd. organised bunting to decorate the street during the festival which was made by school children throughout Shetland – which is still up and looks great! During the conference it was great to see all the people who had traveled to Shetland to either speak or attend the conference. Many were here for the first time, and many people had returned to the Island, but what I thought was the most interesting was that we all had one thing in common. Textiles. The conference had too many interesting talks and topics for me to write about but one which really interested me was Barbara Ridland – a Shetland based contemporary artist – who spoke about her experience in a project called ‘i Vesterveg’. After doing some more research into the project, I can actually remember when it was in ‘Da Gadderie’ at the Shetland Museum, although I don’t really remember knowing that much about it at the time, which is a shame now that I think back. ‘i Vesterveg’ was a collaborative project between artists and museums on Denmark, Norway, Iceland, Faroe and Shetland and was focussed on the spreading of information between these countries of the Nordic cultural similarities and differences which these places have. After reading the in-depth catalogue, which can be found here (http://www.malfridur.no/files/iVesterveg_finalkatalog.pdf) and is definitely worth a read if you are interested in the project and the Northern regions which we belong to, I became so much more informed about the importance of the project. Artists from each place visited each-others homeland where the hosts informed and inspired the visitors of their traditions, history and cultural inheritance. I think this must have been a great way to see the real cultural similarities between all these places, their differences and also a chance to explore somewhere new but so close to us on the map. Focussing back to Barbara Ridland, She created these evocative pieces for the project which used a straw weaving technique. She said “I work mainly as a freelance designer in knitwear, and have an interest in traditional basket-making as a sculptural art form. With no commercial constraints my work becomes an expression of identity, fresh space and light, flight of birds, fish and flora, theatrical folklore, myths and legends. The people of the North Atlantic countries thought that the hills and the sea were full of mysterious persons who could metamorphose themselves into the likeness of beast, bird or fish; fishermen saw sea monsters that were perhaps sharks or whales. My art pieces for ‘i Vesterveg’ are based on these mythical creatures. Another piece made by Barbara which has been photographed on the Shetland coastline. I think this is a great way in showing the scale of the pieces but also illustrates that the Shetland coastline has a mixture of textures and a variety of land across Shetland, yet it is all these differences which makes our island unique and an interesting place to live and be from. Placing these pieces next to the sea also links well to the thoughts that the project manager, Malfridur Adalsteinsdottir, had about the sea once connecting the North Atlantic countries together in the past but now in the present it is what separates them as to travel by sea takes to long in these fast paced modern times. I have only briefly touched on this project, but I find it so interesting to read about the Northern regions which surround us up here in Shetland and to read that people from further North still feel the connection to us even though we have been part of Scotland for some time. This brings me back to how we have our own ‘Northern Identity’ which I have spoken about before. Because of where we are on the map, we have connections above us to the Nordic regions which we once belonged to and now we are also connected to Scotland and UK. We have a very special island here!